Black Walnut (Juglans nigra) trees are all around here. This time of year they are thumping on roofs, smashing into cars, and sending the squirrels into a frenzy. I was first introduced to Black Walnut as a medicine over 15 years ago while in herb school, though it wasn’t until we moved onto our little homestead, and had outdoor animals to take care of, that I really got to know it. Black Walnut is traditionally used as an anthelmintic (That’s your vocabulary word of the day. Use it the next time you are talking to your vet or doctor about worms and they’ll think you are super smart! ) That basically means that it works by expelling parasitic worms from the body. Animals that spend most of their lives out doors (in our case, our farm dog and our chickens) are super prone to getting worms. 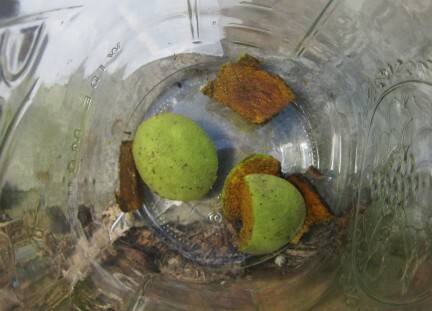 I’ve talked about my use of Black Walnut with Suki and heart worm (see the comment section of that post), but I also use Black Walnut as a dewormer for our chickens. 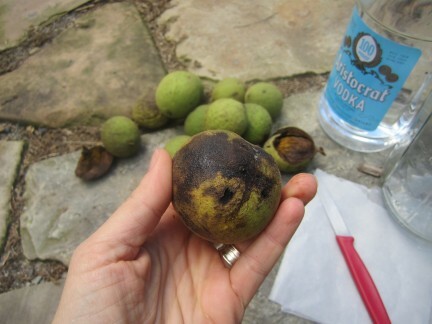 Twice a year, in the spring and late summer, when the weather is humid and muggy, I give them a Black Walnut preventative in their water (60 drops in a gallon of water) for two weeks. If I ever notice those classic symptoms of a wormy chicken (sluggish, droopy wings, decrease in laying), I will give them another week of it. It works wonderfully! 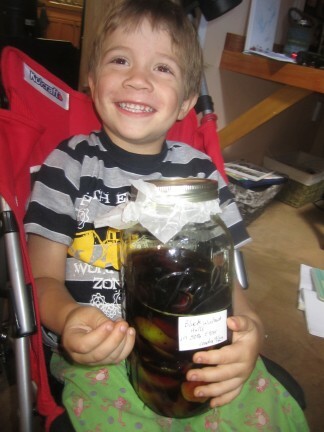 Black walnut tincture can cost $10-$15 an ounce in the store…. I can make a quart of it (32 ounces) for about $10. That’s about .31 cents an ounce! So, how do you do it? It’s easy! 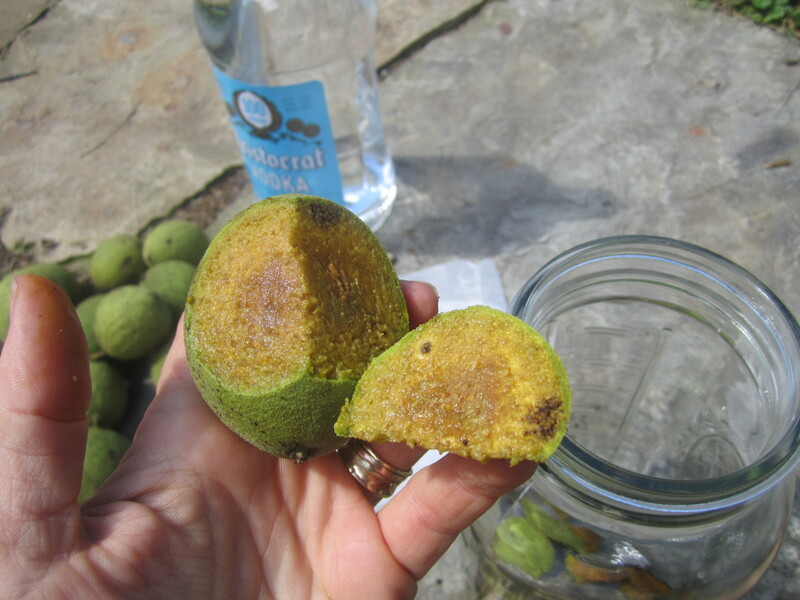 Black Walnuts (I used about 12 to make a quart of tincture) You can harvest them this time of year. It’s easiest to grab them off the ground after they have fallen, because they grow pretty high up in the trees. will look like this inside. Ewwwww! Though the chickens might not mind tinctured worms, I do! This is what you want your walnuts to look like when you cut off the hull (or outer layer). 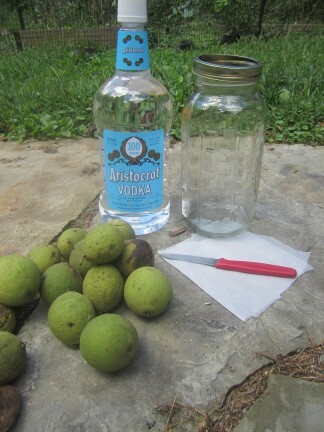 Cut the hull off of the walnuts and put the hulls in your jar. 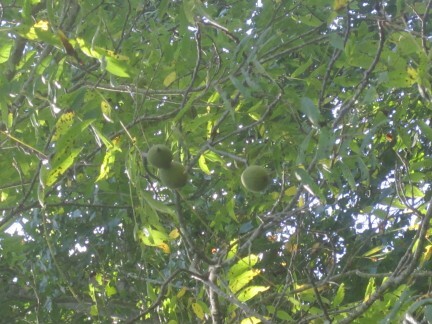 You will see the black walnut start to darken before your eyes! Seriously! It starts oxidizing immediately!! I begin pouring the alcohol into the jar as I’m cutting the hulls. 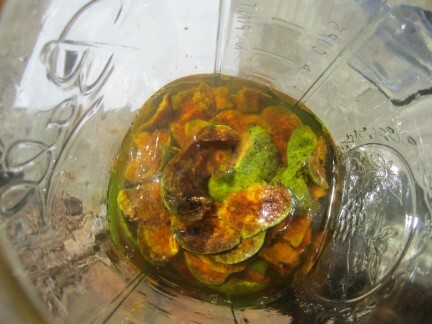 This keeps them from oxidizing so rapidly in the air, and puts all the good medicine in the alcohol. So, the gloves. Yeah. It’s a good idea to wear gloves while you are cutting Black Walnuts as they can stain really badly. I forgot to pick any up at the store, so I just went for it. 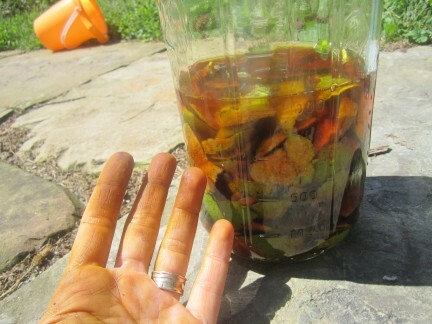 I think, from all the Black Walnut juice that I soaked up through my skin, I can safely say that I am now free of worms! By the end of the cutting process the color of the alcohol had already changed dramatically, as had my fingers. Once you cut the hulls, put them in the jar and cover them with the alcohol, you want to put the top on the jar. A layer of wax paper goes in between the glass and the lid. This keeps the alcohol from reacting with the metal. About 15 minutes after taking the above picture, Leif asked if he could be in one of the pictures with the Black Walnut. Check out the color difference already!! 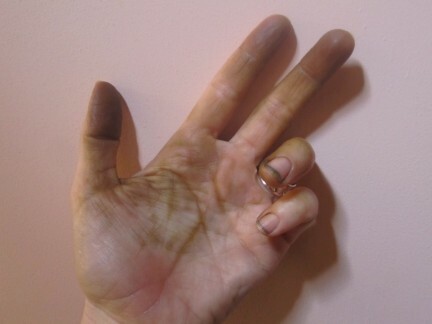 And my hands…… My fingers are about 10 shades darker as I type this!! 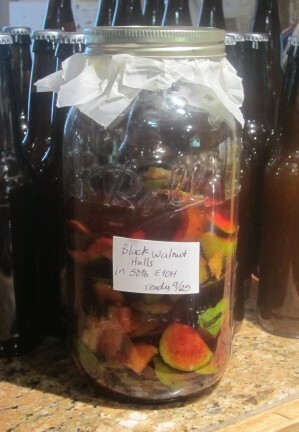 After letting the tincture sit for 2 weeks, you can strain the hulls out. I use muslin/cheese cloth to get all the little bits out of the fluid. 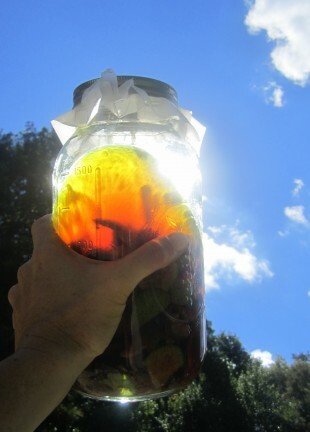 Save your tincture in a clean, labeled jar (don’t forget that layer of wax paper) and store in a cool, dark place. You can bottle it up in little dropper jars for easy use. 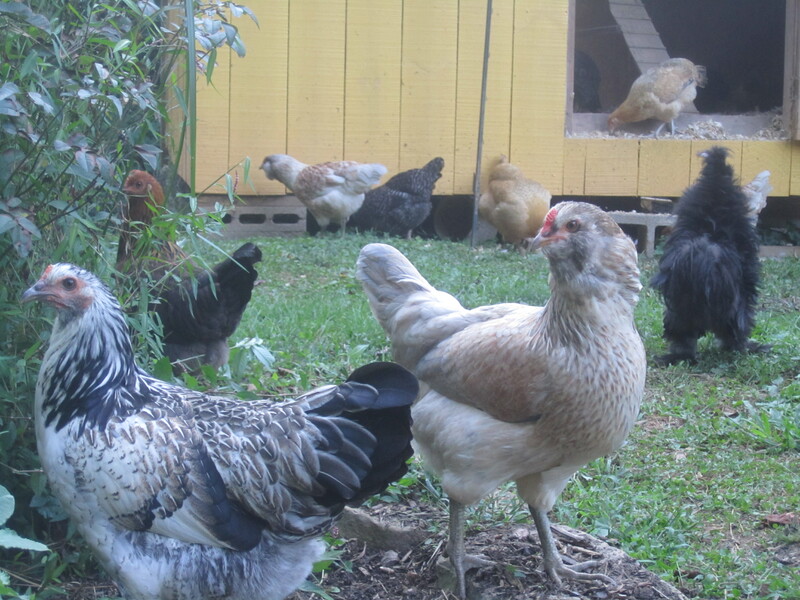 Oh, and unlike many of the chemical dewormers for chickens that are on the market today, you can still eat the eggs of your chickens while they are taking Black Walnut tincture!! This entry was posted in Do It Yourself, Holistic Medicine. Yes, like you said, you can eat the meat inside the black walnut. The are a bit more bitter than the traditional English walnut, but some people love the taste. I have a relative that makes black walnut syrup and cakes every year. I’ve also see the shell sliced and used a jewelry. I can’t wait to make this for my girls. I never like using chemicals to kill worms. Great article. I have a question. Can you use it for dogs? My dogs catch rabbits all the time and rabbits are loaded with worms. 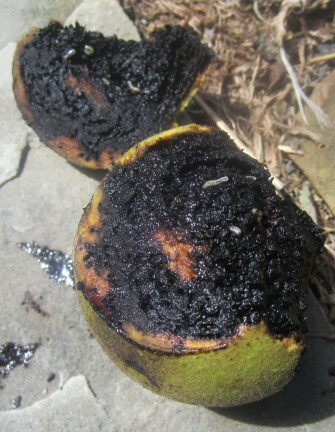 Black Walnuts have been used for parasites in humans. So, when my dog got worms, I did use it for her with great success! Do you have any idea how much 60 drops is? Like maybe 2 t or 1 T? So happy to have found a use–a very good use!–for black walnuts. My chickens thank you. Hey Cheree! Sixty drops would be equivalent to about 1 tsp. It is good to know there is a positive use for this tree. Sadly, it is also a powerfully toxic substance to most vegetables and at least some trees. I’ve lost a garden and several fruit trees because I didn’t know. Also, wondering if anyone has an easy solution to the blackening. It is incredibly difficult to get off. Thanks! Yep! You are totally right! Nothing likes to grow under a black walnut tree! And no, unfortunately, it’s also a strong dye. I don’t know of anything that will get it out of clothing. Instead of vodka to soak the nut hulls in, do you know if if vinegar would also work? Is there a ratio of hulls to vodka that should be used? Do you wash the walnut hulls before putting them in the jars for preparation? I’ve never used it that way, but chemically, it should work. I believe Vinegar will extract the juglone from the black walnut and that is the main parasiticide component in black walnut hulls. As far as what ratio….. often when using fresh herbs, herbalists will try to get a 1:1 or 1:2 ratio (meaning 1 part (grams) of herb per 2 parts (mL) liquid. But, again, I’ve never made this with vinegar, so it may take some googling to see if you can find a recipe. And yes, I will give the hulls a scrub in water, but nothing crazy, just like you’d clean a potato before baking. it may have been answered already but how are maggots crawling on what’s supposed to kill worms? That’s a very good question and one that I can’t find the answer to. My though is that the Walnut Husk Fly larvae is resistant to the components in Black Walnut that kills other parasites. I happen to have powdered black walnut hulls. Do you know if I can feed it directly to my chickens (maybe mixed in oatmeal) as a seasonal wormer, or must it be in tincture form? If the powder is acceptable, any idea on amount to give daily for 2 weeks? If only in tincture form, can I make a tincture from the powdered hulls? Thanks so much for any help you can offer. Hey Amy! I have not used the powdered form, but I have seen it on the market in powdered (capsule) form for use as a parasiticide. Mixing it into their oatmeal sounds like a good delivery method. I would start small and increase the amount if you still see worms. You may be able to find more info on using the powder form through google.